April was a Conversation Assistant last year (2009-2010). She enjoyed it so much, that she decided to return this year, and she’s staying in La Garriga, working as a Conversation Assistant at Escola Sant Lluís Gonçaga. She is enjoying the experience, and so are all the students! “We think that’s great April is here because we’re learning a lot”. “April is an active and funny person”. “We practice our speaking and listening, it’s great”. “We play some games, this helps our pronunciation”. “It’s an easy way to learn English”. “She explains us some interesting stories about her life”. And now it’s April’s turn to explain us what she does in the school, with her classes that range from P3 to 4th of ESO, and what living in La Garriga is like for her. My name is April and I am working as a conversation assistant in Escola Sant Lluís Gonçaga in la Garriga, Barcelona. This is my second experience working with the Home to Home program and both experiences have been really different! I have really enjoyed learning about the Spanish and Catalan cultures, seeing different teaching styles, exploring areas of Catalunya and of course eating food like fuete, pan con tomate, coca and La Mona! This year I am living and working in la Garriga. It is a small beautiful village in the Vallés Oriental area of Barcelona. The town is small and very catalan, I always see parents and children from school in the center and love taking walks down the beautiful Passeig. My favourite thing of the town is that is is filled with amazing Modernist houses designed the modernist architect Manuel Raspall. This week I have taken two school trips with P5 to explore the architecture around the town and make our own modernistdecorations with clay. The school is also small. There is one class for every age group from P3 – 4 ESO which is great as I can spend more time with each class and get to know the kids better. I spend most of my time with the ESO classes. I take small groups of 4-5 kids and we spend the classes doing a lot of talking, playing games, listening to music and sometimes watching films in English. I try to keep the lessons fun as I think it helps everyone learn a language if they are enjoying it! So we do different activites like filming our own mini movies. Teaching ESO isn’t always easy though. Some days if I haven’t planned enough it is hard to get them excited, and the students have a very varied level of English. Some can talk all day, and some barely speak at all. It has taught me a lot about gaining and keeping interest, in preparing lessons and thinking on my feet! I stay with the teacher in the Primary and Parvulari classes. We work from the books, sing songs and read stories. My favourite class is P5. The class is a little crazy! They love to talk, to move and to hear me speak in my really bad catalan! The class I help with is art based and I am there to assist the teacher, while speaking English of course, but end up spending my time joining the kids in whatever messy art activity they are doing. Thankfully, the teacher doesn’t mind and I have a lot of fun in these classes! 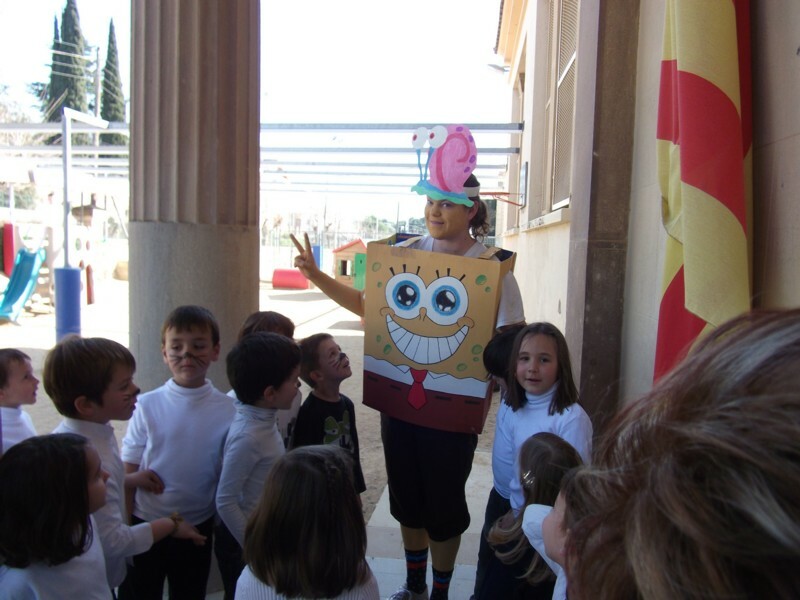 The different holidays have been fun, I especially enjoyed Carnaval when I dressed up as Bob Esponja, and making Panellets on Castanyada. I also love going on excursions. It is a more relaxed atmosphere and I have seen a lot of Catalunya. I am still hoping the school takes a trip to PortAventura, but I think this is unlikely! April dressed as Bob Esponja (Spongebob) in Carnaval! Unlike some of the other conversation assistants, I am only staying with one family for the entire 9 months. This has good benefits as I really feel like part of the family now, I have been able to know the kids really well and don’t have to pack and unpack every month. But I also think it would be a good experience to see different families and get to know more people. My family have 3 small girls, age 2, 4 and 6. This is an adjustment for me as I haven’t been around small children since I was 10. But it is also fun, we play a lot and I am always watching Bob Esponja with them. I speak to them in English and Spanish and they are very helpful as we can have very simple conversations. At the weekends I normally have lunch with the family, the uncles, the grandparents and we have traditional Catalan food and very good coffee. The hardest thing for me is learning Spanish in Catalunya. In my village I never hear Spanish on the streets and while the teachers in school make an effort to speak to me in Spanish, 90% of the time I am surrounded by Catalan. I can understand simple conversations now in Catalan, especially when the teachers are explaining in class. But I am glad I am in Catalunya, it has been a really good experience to learn about another culture, they have everything here, the beach, the beautiful cities, the mountains and tasty food!